One of the largest marathons in the greater Northeastern Ohio area, the Akron Marathon serves as the premier fall racing event in the area. 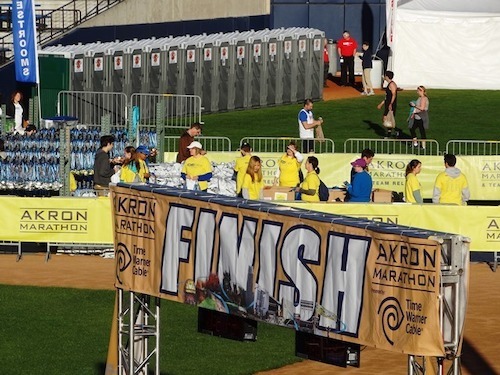 With a record-breaking 15,000 marathon, half marathon, and relay runners, the sold-out 2014 Akron Marathon required some major planning and strategy in order to fill the need of thousands of runners and spectators. We were up for the challenge. We worked with the race organizers to create a plan that made the most sense for the runners and their needs. The last thing an organization taking care of thousands of runners and nearly 100,000 spectators wants to worry about is portable units, so we took the worry out of their hands by delivering to them clean, portable toilet units in key areas. We took care of cleaning, setup, and take down as a part of our relationship with the client so that race organizers could focus on putting their own stamp on their event. Check out some of our photos from the 2014 Akron Marathon below. Want to see what we can do for your event? Contact us today to request a quote!